The case for abandoning the tree metaphor for evolution is one that has support from the field of evolution itself. In previous essays, I've proposed the braided river model as providing a richer picture and vocabulary for evolution, both in species and in ideas and cultural functions like religion. In this essay, I want to look at the actual features of the River Ganges along its path and see how these might enrich metaphors for evolution. The imagery of rivers features strongly in the history of Indo-European languages. And Indian literature is full of references to and metaphors drawn from rivers. I've argued, for example, that the important contrast between samyañc and mithyā make most sense in relation to a river bed very like the ones seen in the images below. One follows the stream, bending with it (sam-y-añc) or one tries to cut across and fight one's way forward (mith-yā). If we look at the image above, it shows only the major rivers associated with the Ganges Basin. The hydrological cycle has a number of main features in this view. Firstly, the catchment area extends both north (into the Himalayas) and south (the Vindhya Range). 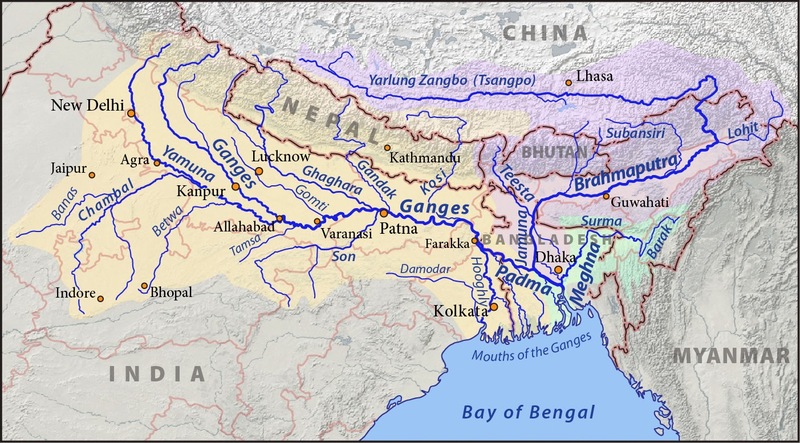 The Ganges accepts tributaries along almost its entire length. Catchment basins give rise to numerous small streams. These streams combine into larger streams, and these into rivers and larger rivers (and this fact is used metaphorically the Pāli Canon: e.g. AN i.243. ii.140, v.114; SN v.396; and also in the Chinese Madhyāgama 43-54). If we stand on the Maṇikarṇikā Ghāṭ in Varanasi and look out on the Ganges River we see a classic large river contained by two banks though, of course, during the monsoons it often breaks its banks. Most of us have probably seen it in tourist season after the temperatures have dropped a bit, the rains have stopped and the river is well behaved. And, seeing this clearly defined waterway, we think "Ganges River". Even an entity defined by change and process can still have a valid identity, if that change takes placed within well-defined boundaries. In fact, the Yamuna contributes nearly 60% of the flow at the confluence (that's a ratio of 3:2). Thus, the resulting river ought to be called the Yamuna. However, for historical reasons, it is called the Ganges. This point of confluence used to define the eastern edge of the āryavarta or the homeland of the Brahmins. Up until just before the time of the Buddha, anywhere east of this point was considered barbaric and foreign by the mainstream Brahmins. The early Upaniṣads document the tensions between āryavarta and eastern Brahmins (Signe Cohen), and there are scattered references to distinctive "western Brahmins" in the Pāli Canon (e.g., S iv.312). Indeed, the distinction appears to be current during the period the Pāli Canon was composed, since there are scattered references to Western Brahmins who have distinctive habits. Another feature we see is that the Ganges has wandered around the plain, leaving behind distinctive oxbow lakes and sinusoidal shaped dry river beds which are clearly seen in satellite photos (below). We know that some developments in Buddhism simply dried up, and some continued to exist cut off from the mainstream. Similarly with human evolution - Homo habilis, for example, did not survive into the present. At times small pockets of human species survived for a time in isolation, e.g., H. floresiensis, which predates modern humans, but whose remains have been found with stone tools dated to only 13,000 years ago, which is well into the era of H. sapiens. H. neanderthalensis had significant periods of cross-over with H. sapiens in Europe and Asia, where they appear to have shared genes (hybridised), though this did not happen in Africa. And so on. The feature I have already highlighted is the braided stream typical of the mature plains river. We can see this on the Ganges as it passes Patna (below). The river is still accepting tributaries, but it is also diverging into separate (major) streams and re-converging. In the image below, the large Son River enters from below left, with the city of Patna mainly to the left of the confluence. The Gandak River converges from above left. The final stretch of the Ganges sees it combine with the Brahmaputra River (marked with a circle) but then fan out into a massive delta as it reaches the Bay of Bengal. The combined rivers continue to flow past the ocean-land boundary, depositing banks of sediment that are coloured light blue in this image because they represent shallow water. In the map, one can also see the ancient course of the combined river carved into what is now the continental shelf, from when sea levels were very much lower (when, for example, our ancestors were on their way from Africa to Australia ca. 65 kya to 45 kya). The present mainstream view sees evolution as being much like the delta region - a single source fans out into multiple streams producing present day variety. The present tree model has no roots, but it also over-simplifies the trunk. The trouble is that this is how history looks when viewed from any point and one is focussed on a single issue. The complexity of the Iron Age, for example, might be traced back to the discovery of Iron. But then iron working extended previous metalworking techniques, and had to be accompanied by advances in kiln technology (since iron requires much higher temperatures) which, most likely, affected the production of pottery and created an industry for coke making. At best, historians of various kinds (and I include evolutionary theorists in this rubric for this purpose) might see several contributing factors to any particular event or phenomenon when, in fact, everything is deeply and multiply interconnected. What symbiogenesis and hybridisation tell us about evolution is that it is not a simple system of linear development with binary divergence, but a complex dynamic system including convergence, with symbiosis and hybridisation as the norm rather than the exception. Almost every tree has an associated mycorrhizal fungus symbiont that keeps it alive; without their symbiotic gut bacteria, larger animals could not survive. The individual is simply a community seen from sufficient distance to blur the details. It's long been a given in academia that Buddhism, as far as we know it, is the product of a community of people or, indeed, the products of interacting communities more or less members under the Buddhist umbrella. I've tried to extend this by arguing that the community in question has roots in Iran, and has interacted with local communities of a wide variety of types - speaking languages from at least four major groups: Indo-Aryan, Dravidian, Austro-Asiatic, and Tibeto-Burman. Despite differences, these communities probably shared regional cultural traits such as a belief in a rebirth eschatology, and regional linguistic traits such as retroflex consonants. In the history of Buddhism one convergence event stands out almost more than any other. This was the 6th century synthesis we call Tantra. In this renewal of Indian religion the various streams of Indian thought and practice were combined, probably at least partly in response to the socio-political chaos of the collapse of the Gupta Empire (Ronald Davidson). In Tantra we find much of Buddhism at the time synthesised with Vedic theory and ritual, shamanistic practices, and yoga, etc., to create an entirely new approach to life and liberation.